A persistent challenge in simulating damage of natural geological materials, as well as rock-like engineered materials, is the development of efficient and accurate constitutive models.The common feature for these brittle and quasi-brittle materials are the presence of flaws such as porosity and network of microcracks. The desired models need to be able to predict the material responses over a wide range of porosities and strain rate. Kayenta  (formerly called the Sandia GeoModel) is a unifi ed general-purpose constitutive model that strikes a balance between rst-principles micromechanics and phenomenological or semi-empirical modeling strategies. However, despite its sophistication and ability to reduce to several classical plasticity theories, Kayenta is incapable of modeling deformation of ductile materials in which deformation is dominated by dislocation generation and movement which can lead to signi cant heating. This stems from Kayenta’s roots as a geological model, where heating due to inelastic deformation is often neglected or presumed to be incorporated implicitly through the elastic moduli.The sophistication of Kayenta and its large set of extensive features, however, make Kayenta an attractive candidate model to which thermal eff ects can be added. This report outlines the initial work in doing just that, extending the capabilities of Kayenta to include deformation of ductile materials, for which thermal e ffects cannot be neglected. Thermal e ffects are included based on an assumption of adiabatic loading by computing the bulk and thermal responses of the material with the Kerley Mie-Gruneisen equation of state and adjusting the yield surface according to the updated thermal state. 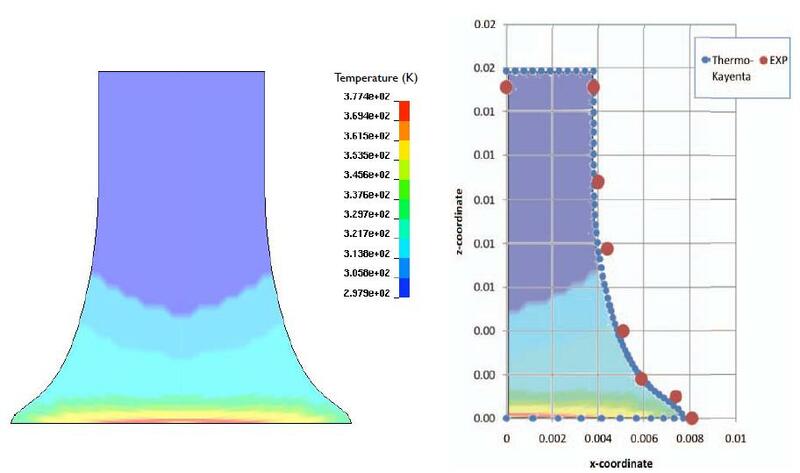 This new version of Kayenta, referred to as Thermo-Kayenta throughout this report, is capable of reducing to classical Johnson-Cook plasticity in special case single element simulations and has been used to obtain reasonable results in more complicated Taylor impact simulations in LS-Dyna. Despite these successes, however, Thermo-Kayenta requires additional re nement for it to be consistent in the thermodynamic sense and for it to be considered superior to other, more mature thermoplastic models. The initial thermal development, results, and required refinements are all detailed in the following report. This entry was posted in Projects, Publications, Reports, Research and tagged accuracy, continuum mechanics, damage, deformation, elastic, equations of state, experiment, files, laws, material, mechanics, models, PhD research, plastic, plasticity, porosity, rock, simulation, strain, thermodynamics, validation. Bookmark the permalink.